16GB SSD (64GB would be better). USB Drive (USB2 installation media). USB Keyboard (only for installation). 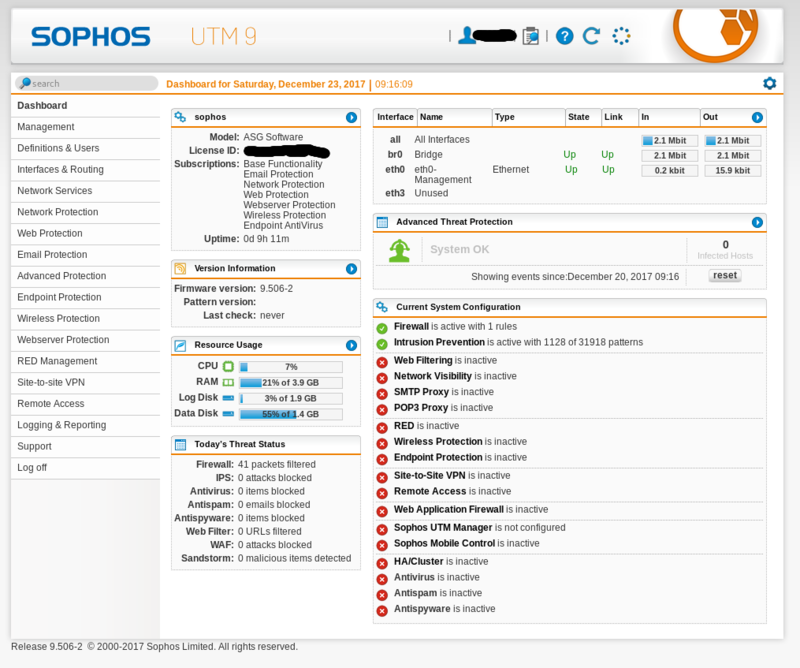 Sophos UTM 9 (asg-9.506-2.1) ISO. Network connected to first interface (next to serial port). Install is a bit difficult. Snort takes a lot of CPU (>90% on a single thread), during a speedtest download speed is now around 50mbit instead of 120. Intrusion Prevention active with 1718 of 31918 patterns. Register and download ISO https://www.sophos.com/en-us/support/utm-downloads.aspx. Log in and download license file. Boot APU2, press F10 and select USB drive. # Test ping from other machine. Log in, using SSH, from another machine. Press alt-f1 and continue with the installation. It will take around 15 minutes to install. After boot you will hear a few beeps. Open the webgui to continue configuration.